It's inevitable: More do-it-yourself solar panels will be available, this time in your nearest Lowe's. Lowe's is now carrying solar panels from Los Gatos, Calif.-based Akeena Solar that feature built-in writing and racks and an installation technique that aims to simplify the steps and shorten the time it takes to put solar panels on a rooftop (see video from Akeena). Lowe's is selling the Andalay at $893 per panel, available at 25 stores in California. 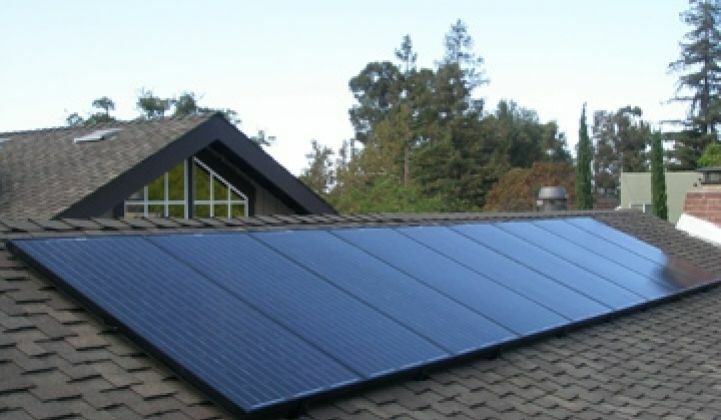 Akeena said handy homeowners could install the panels themselves if they don't want to hire people to do it, but they might still need an electrician to connect the rooftop system to the home's circuit. The announcement brings home what Akeena and some other solar companies see as the future of residential solar market. Instead of hiring contractors or roofers, homeowners could install solar panels themselves and save on labor costs (see An Ikea for Solar? and Getting Solar Energy Cheap and Easy). A number of startups are developing this kind of do-it-yourself solar energy systems, including Armageddon Energy (see video). Meanwhile, companies such as Dow Chemical are working on solar cell-embedded roofing materials, which will require strong insulation to protect the cells from moisture and other weather elements (see Dow to Roofers: Our Solar Shingles Are Coming). Other big-box retailers such as Home Depot already sell solar panels and related parts, though they sell them along with installation services and even financing. Whether homeowners would embrace the do-it-yourself idea is uncertain. A solar energy system remains a bulky appliance, and erecting them on a roof isn't as easy as plugging in your big-screen TV. Akeena announced an impending launch of Andalay in late 2007, and followed up with another press release in early 2008 to say it would buy microinverters from Enphase. Akeena began selling Andalay systems in May this year. Petaluma, Calif.-based Enphase formally launched its first microinverter product in mid-2008 (see Enphase Energy Seeks New Converts). The startup says its microinverters could better monitor the power output of each panel, and they could harvest more energy from the panels as well. The use of microinverters allows Akeena to design a simpler solar energy system. Each Andalay panel has a microinverter attached at the back for converting the direct current from the solar panels to alternating current for on-site use or for feeding the grid. Most of the solar energy systems installed today use centralized inverters. Using microinverters allows Akeena to eliminate some of the high-voltage DC wiring that would otherwise be necessary to bring the electricity from solar panels to a central inverter, which typically sits in a box next to the house. Akeena has designed panels with electrical connectors on the side of each panel, so that plugging them together should be even simpler than the version available on the market now. The new design is undergoing testing at Underwriters Laboratories. Photo of an Andalay solar panel installation via Akeena Solar.